Advocacy helps the philanthropic sector advance our mission, increase our funding sources, and solve community and societal problems. We work collaboratively with business and government to help build a better quality of life for individuals and families across Indiana and beyond. To that end, IPA is pleased to host our 2018 Legislative Luncheon series in nine regions around the state. 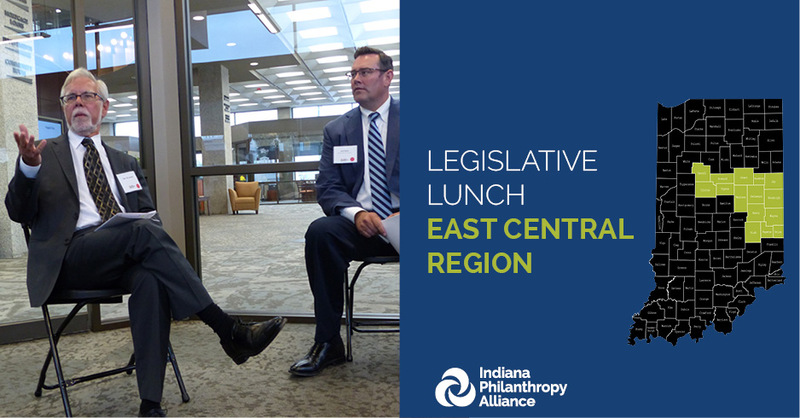 Join your elected officials and other local grantmakers for a casual, conversational luncheon about your community issues and areas of concern. The goal is to develop new–or strengthen existing–relationships with legislators and help them understand how philanthropy is having an impact. We hope you will join us for these important conversations. New this year: In order to make our conversations as meaningful as possible, during registration, you are asked to select issues most important for your community. Your responses will be used to help drive our conversations with policymakers. You must be logged into the website to register; then click the "Register Now" button above. If you do not have an existing account, register for one here. Allow 48 hours for account approval, or for immediate access, contact Marilee Steckler at 317-630-5200 Ext. 119. Legislators are asked to RSVP directly with Catrena Morrow. Please contact Catrena Morrow by email or call at 317-630-5200 Ext. 110. IPA members are encouraged reach out and invite their local legislators and board members you may send them this invite. Legislators are asked to RSVP directly with Catrena Morrow. Go here to register for another of our nine Legislative Lunches held throughout the state.